Astronaut photograph ISS028-E-18562 was acquired on July 22, 2011, with a Nikon D3S digital camera using a 48 mm lens, and is provided by the ISS Crew Earth Observations experiment and Image Science & Analysis Laboratory, Johnson Space Center. The image was taken by the Expedition 28 crew. Caption by William L. Stefanov, Jacobs/ESCG at NASA-JSC. In classical Greek mythology, the island of Crete was home to King Minos and the terrible Minotaur, a beast that was half man and half bull. The known historical record of Crete is no less impressive. The island was the center of the Bronze Age Minoan civilization that flourished from approximately 2700–1420 BC. There is archeological, geological, and cultural evidence to suggest that a cataclysmic volcanic eruption of Santorini volcano around 1620 BC was a major cause of the decline—if not complete destruction—of the Minoan civilization. Today, Crete is the largest and most heavily populated island of Greece (or the Hellenic Republic). The island stretches approximately 260 kilometers (161 miles) from west to east, and it is roughly 60 kilometers (37 miles) across at its widest point. The rugged terrain of Crete includes mountains, plateaus, and several deep gorges. The largest city on the island, Heraklion, sits on the northern coastline. Several smaller islands ring Crete. Two of the largest of these, Dia and Gavdos, are sparsely populated year-round, although Gavdos hosts numerous summer visitors. 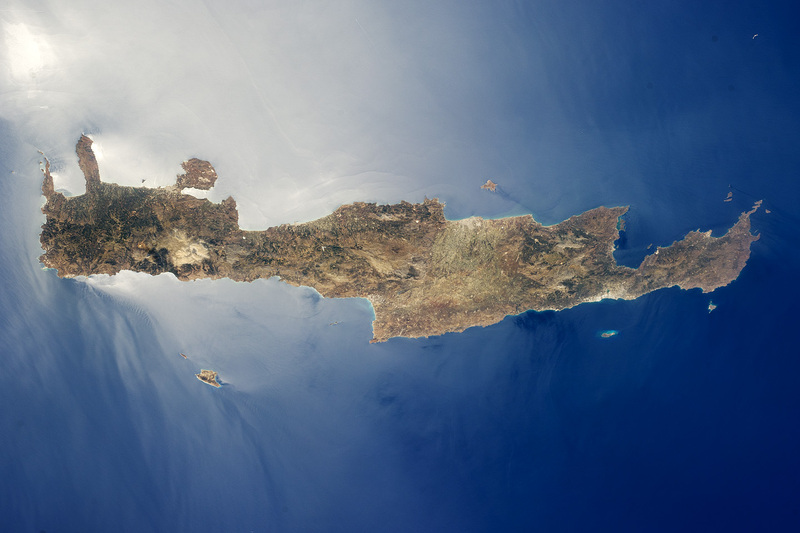 The western and central parts of Crete appear surrounded by quicksilver in this astronaut photograph taken from the International Space Station. This phenomenon is known as sunglint, caused by light reflecting off of the sea surface directly toward the observer. The point of maximum reflectance is visible as a bright white region to the northwest of the island. Surface currents causing variations in the degree of reflectance are visible near the southwestern shoreline of Crete and the smaller island of Gavdos (image lower left). Mid-latitude storm tracks are major weather patterns that account for the majority of precipitation in the globe’s middle latitudes, which includes most of the heavily populated areas of North America, Eurasia, and Australia. Due to atmospheric circulation and the dynamics of weather systems, these bands of low pressure form repeatedly in the same locations. Apart from being meteorologically important, they’re also major players on the climate scene—clouds in these regions are responsible for reflecting much of the incoming solar radiation that is bounced back to space before penetrating Earth’s atmosphere. Many climate models have predicted that the positions of these storm tracks would slowly migrate toward the poles, but so far this trend had not been detected. However, analysis of 25 years worth of data from the International Satellite Cloud Climatology Project now indicates that this shift is probably already taking place. The International Satellite Cloud Climatology Project (or ISCCP) operates a network of geostationary and polar orbiting satellites that have been collecting data on clouds since 1983. A team of researchers carefully analyzed data for Northern and Southern Hemisphere storm tracks in the Atlantic and Pacific Oceans to look for trends in storm track positions. The results indicated a slight poleward shift of the storm tracks. These satellites have known data issues: measurement changes when new satellites came online, lower data quality at the “seams” between coverage from different satellites, etc. So the authors tried several different analysis techniques to test the robustness of the observed trend. Each technique decreased the rate of the observed poleward movement somewhat, but the general trend remained. That’s mainly interesting because it had been predicted by many climate models. But the data also shows something that may be much more important, though there are some considerable uncertainties involved. The satellite observations also show a roughly two-to-three percent reduction in total cloud cover since 1983. This occurred through a large decrease in low-level cloudiness, and it came despite a slight increase in high-level cloudiness. Both of these changes act as positive feedbacks to warming, and, as we recently covered, cloud feedbacks are among the largest sources of uncertainty in temperature projections. High-level cirrus clouds aren’t thick enough to reflect much incoming solar radiation, but the increase in water vapor means more trapping of outgoing infrared radiation (the greenhouse effect). Most reflective action is in the low-level clouds, so a decrease there means more incoming solar radiation penetrating to the Earth’s surface. Although the same models that predict the poleward movement of storm tracks also predict reductions in total cloud cover, the paper is heavy on caveats here. The most interesting data comes at the limits of detection for these satellites, making it unclear how robust the signal is. Like the storm track positions, the trend is consistent among the regions studied, though. In addition, satellite observations of atmospheric radiation fluxes (from the Earth Radiation Budget Experiment) corroborate the changes in cloud behavior. Studies like this underscore the importance of Earth-monitoring satellites operated by NASA and the ESA. Global climate data isn’t easy to come by, and the analysis is often difficult under the best of circumstances. Increasingly accurate projections require the kind of data only these satellites can provide. Crew from one of the world's fastest single hull racing yachts linked arms to survive a freak accident in the Fastnet race which left them stranded for hours in surging waves in the Celtic Sea. Five sailors from Rambler 100, which was leading the race off the south coast of Ireland, were thrown from their vessel when its keel snapped off in rough seas and it "turned turtle just like a dinghy capsizing", according to Mick Harvey, the boat's project manager. With some difficulty, the remaining 16 crew managed to clamber on to the upturned hull of the stricken vessel where they awaited rescue for two and a half hours in foggy conditions before dark on Monday evening. The five who were thrown clear close to the turning point at Fastnet rock were swept out of sight and linked arms in a circle to survive. Among them was the boat's owner George David, 69, the former chairman of United Technologies Corporation, along with his girlfriend, Wendy Touton. "Soon after rounding the Fastnet Rock, the wind went south-west right on the nose," Harvey said. " We were beating into big seas, launching the Rambler off the top of full size waves. "I was down below with navigator, Peter Isler, when we heard the sickening sound of the keel breaking off. "It was instantaneous – there was no time to react. The boat turned turtle, like a dinghy capsizing. Peter issued a Mayday and we got out as quickly as we could. It was a scary moment, one that I will never forget. I can't begin to tell you how relieved I am that all of the crew are safe." The bespoke "super maxi" racing yacht was worth £3m to £4m and had been "going very fast, pushing for the record and crashing through the waves," Eddie Warden Owen, the chief executive of the Royal Ocean Racing Club, which runs the Fastnet race, said. Earl Williams was at the helm of the yacht and told RTE radio how he heard a "big bang" just after rounding Fastnet rock. "I looked up thinking it was something in the masts," he said. " But the boat was just capsizing. I realised it was the keel as the boat was going over. It started to turn upside down quite quickly and we didn't have a lot of time. "We had people asleep aboard and people down below changing watches. Several of the crew from inside the boat were very lucky to get out in time." The five who were swept away were wearing their full red sailing suits and bright yellow inflatable life-vests and were carrying global positioning system devices. Hypothermia was the greatest risk to their lives, Owen said. A lifeboat from Baltimore, Co Cork, picked up the 16 who had scrambled on to the hull of Rambler 100, before a dive boat from another racing outfit, Team Phaedo, which was already in the area to take pictures of its yacht, joined the search for the missing five sailors and located them after picking up a signal from their tracking devices. "We pulled aboard our dive vessel owner George David and his four crew members who had all been strapped together – cold but healthy, happy, safe and well," said an entry on the Team Phaedo Facebook page. Touton was airlifted by helicopterto Kerry hospital for treatment for hypothermia and was said by Harvey to be "doing fine". The four others were taken to Baltimore where they were reunited with the rest of the crew. Jerome Kirby described seeing the hull of the boat drifting away from him several hundred yards away. "They didn't know we were in the water so nobody was looking for us," he said. "It was mad. We had people below. Luckily everybody had life vests on. If we didn't have life preservers on, it would have been a disaster. If they hadn't found us the other five could still be drifting out there." "It is just amazing. We want to thank everybody ... Boats do tip over. We don't like it and its not a common event but it does happen from time to time.The keel fin has fractured. It has just snapped off. This is a piece of solid stainless steel. It is designed not to do what it did." The first teaser trailer for the documentary film, "Our Blue Canoe" which is currently in production and highlights the epic modern-day journey of the Pacific Voyagers. The Cook Islands' vaka (canoe) set sail from New Zealand in April alongside several other vakas representing other Polynesian nations. The journey was to honor Polynesian culture and revive traditional respect for the ocean by using celestial navigation propelled by the wind, sun and solar electrified motors. "The Pacific Ocean is our breath -- our life, our future." Cook Islands' Honorable Prime Minister Henry Puna was in San Francisco speaking about his country's commitment to environmental protection through a plethora of programs they have established -- from renewable energy to whale sanctuaries. Mr. Puna stated that by 2020, Cook Islands will be using 100% renewable energy sources. The Cook Islands Vaka was docked at Pier 39 on August 10, and departed down the coast of California, making stops in Monterey, Santa Monica and San Diego. The journey is organized through the Pacific Voyagers Network, which aims to develop awareness and preservation of the ocean environment and marine life. Brown, one of the crewmembers talked about the amount of garbage that is polluting the Pacific Ocean, "We only saw a few pieces of plastic floating in the ocean when we first set sail from New Zealand. We would try and pick it up, but then we got close to Hawaii and there was just too much for us to carry on the canoe. It is really sad how much trash is floating in the middle of our beautiful ocean." The nautical journey included a pan-Pacific network of Voyageurs from Aotearoa (New Zealand), Fiji, Samoa, Tahiti, Papua, New Guinea, Solomon Islands, Kiribati, Vanautu and Tonga. Some of their journey has been captured in the inspiring trailer The Blue Canoe. A thriving undersea wildlife park tucked away near the southern tip of Mexico's Baja peninsula has proven to be the world's most robust marine reserve in the world, according to a new study led by researchers at Scripps Institution of Oceanography at UC San Diego. Results of a 10-year analysis of Cabo Pulmo National Park (CPNP), published in the Public Library of Science (PLoS) ONE journal, revealed that the total amount of fish in the reserve ecosystem (the "biomass") boomed more than 460 percent from 1999 to 2009. Citizens living around Cabo Pulmo, previously depleted by fishing, established the park in 1995 and have strictly enforced its "no take" restrictions. "We could have never dreamt of such an extraordinary recovery of marine life at Cabo Pulmo," said National Geographic Explorer-in-Residence Enric Sala, who started the study in 1999. "In 1999 there were only medium-sized fishes, but ten years later it's full of large parrotfish, groupers, snappers and even sharks." The most striking result of the paper, the authors say, is that fish communities at a depleted site can recover up to a level comparable to remote, pristine sites that have never been fished by humans. "The study's results are surprising in several ways," said Octavio Aburto-Oropeza, a Scripps postdoctoral researcher, World Wildlife Fund Kathryn Fuller fellow and lead author of the study. "A biomass increase of 463 percent in a reserve as large as Cabo Pulmo (71 square kilometers) represents tons of new fish produced every year. No other marine reserve in the world has shown such a fish recovery." The paper notes that factors such as the protection of spawning areas for large predators have been key to the reserve's robustness. Most importantly, local enforcement, led by the determined action of a few families, has been a major factor in the park's success. Boat captains, dive masters and other locals work to enforce the park's regulations and share surveillance, fauna protection and ocean cleanliness efforts. "We believe that the success of CPNP is greatly due to local leadership, effective self-enforcement by local stakeholders, and the general support of the broader community," the authors note in their report. Strictly enforced marine reserves have been proven to help reduce local poverty and increase economic benefits, the researchers say. Cabo Pulmo's marine life recovery has spawned eco-tourism businesses, including coral reef diving and kayaking, making it a model for areas depleted by fishing in the Gulf of California and elsewhere. "The reefs are full of hard corals and sea fans, creating an amazing habitat for lobsters, octopuses, rays and small fish," said Brad Erisman, a Scripps postdoctoral researcher and co-author of the article. "During some seasons thousands of mobula rays congregate inside the park and swim above the reef in a magnificent way." The scientists have been combining efforts to monitor the Gulf of California's rocky reefs every year for more than a decade, sampling more than 30 islands and peninsula locations along Baja California, stretching from Puerto Refugio on the northern tip of Angel de la Guarda to Cabo San Lucas and Cabo Pulmo south of the Bahia de La Paz. In the ten years studied, the researchers found that Cabo Pulmo's fish species richness blossomed into a biodiversity "hot spot." Animals such as tiger sharks, bull sharks and black tip reef sharks increased significantly. Scientists continue to find evidence that such top predators keep coral reefs healthy. Other large fish at Cabo Pulmo include gulf groupers, dog snappers and leopard groupers. "I participated, back in the 1990s, in the studies for the declaration of the marine park. Frankly, we decided to go ahead because the community was so determined but the place at that time was not in good environmental health," said Exequiel Ezcurra, Director of the University of California Institute for Mexico and the United States (UC MEXUS) and co-author of the article. "If you visit the place now, you cannot believe the change that has taken place. And all of it has occurred thanks to the determination of a community of coastal villagers that decided to take care of their place and to be at the helm of their own destiny." "Few policymakers around the world are aware that fish size and abundance can increase inside marine reserves to extraordinary levels within a decade after protection is established; fewer still know that these increases often translate into economic benefits for coastal communities" said Aburto-Oropeza. "Therefore, showing what's happened in Cabo Pulmo will contribute to ongoing conservation efforts in the marine environment and recovery of local coastal economies." Shimmering hot water containing white masses of microbes exits from a seafloor vent. Such so-called “snowblower” vents are seen only right after eruptions—evidence of a vast bloom created by these events. Researchers returning from a cruise some 250 miles off the coast of Oregon have reported seeing a volcanic eruption on the seafloor that they accurately forecast five years ago—the first successful prediction of an undersea eruption. The event took place at Axial Seamount, one of the most active and intensely studied undersea peaks in the world. Bill Chadwick, an Oregon State University geologist, and Scott Nooner, a geophysicist at Columbia University’s Lamont-Doherty Earth Observatory, have monitored the seamount for more than a decade; in 2006 they published a paper saying that Axial would erupt before 2014, when seafloor-surface measurements had reached a threshold indicating that the volcano had filled with enough magma to rupture. “Volcanoes are notoriously difficult to forecast, and much less is known about undersea volcanoes than those on land, so the ability to monitor Axial Seamount, and determine that it was on a path toward an impending eruption is pretty exciting,” said Chadwick, who was chief scientist on the recent expedition. Axial last erupted in 1998. Chadwick, Nooner and colleagues have monitored it ever since, using precise bottom-pressure sensors – the same instruments used to detect tsunamis in the deep ocean – to measure vertical movements of the floor of the volcano’s crater, or caldera, much like scientists use satellite ground-positioning instruments on land to measure movements of the ground. Before the eruption, the surface of the volcano was gradually inflating like a balloon, at the rate of 15 centimeters (six inches) a year, indicating that magma was rising and accumulating under the summit. When Axial erupted in 1998, the caldera floor suddenly deflated 3.2 meters (10.5 feet), as magma poured out onto the seabed. The scientists said that the volcano would be ready to erupt again when re-inflation pushed the caldera floor back to its 1998 level. “Forecasting the eruption of most land volcanoes is normally very difficult at best, and the behavior of most is complex and variable,” said Nooner. “We now have evidence that Axial Seamount behaves in a more predictable way than many other volcanoes.” Nooner said this was likely due to the volcano’s robust magma supply, coupled with its thin crust, and its location on a mid-ocean ridge, where the crust is constantly spreading. On land, scientists have honed techniques for monitoring dangerous volcanoes such as Washington's Mount Rainier and Italy's Vesuvius. However, false alarms and nasty surprises, such as the unexpectedly powerful 1980 explosion of Washington's Mount St. Helens, are more the rule than the exception. No two volcanoes are alike, but the research at Axial could add insights into the potential behavior of similar volcanoes, said Nooner. The scientists discovered the eruption on July 29, while Chadwick, Nooner and University of Washington colleagues Dave Butterfield and Marvin Lilley were leading an expedition aboard the research vessel Atlantis, operated by the Woods Hole Oceanographic Institution. Using Jason, a remotely operated robot submarine, they spotted a lava flow that had not been there the year before. “When we first arrived on the seafloor, we thought we were in the wrong place, because it looked so completely different,” said Chadwick. The eruption excited biologists, too. When undersea eruptions occur, huge amounts of heat emerge, the chemistry of seafloor hot springs changes, and pre-existing biological communities are often destroyed, while new ones form. Some species are found only right after eruptions. Butterfield has been tracking the chemistry and microbiology of hot springs around the caldera since the 1998 eruption. “The seawater within the caldera was much murkier than usual, and that meant something unusual was happening,” he said. The scientists will examine the chemistry of vent water samples and work with Julie Huber of the Marine Biological Laboratory to analyze DNA and RNA of microbes in the samples. The team also recovered instruments, including two bottom pressure recorders and two ocean-bottom hydrophones, which showed that the eruption took place on April 6 of this year. A third hydrophone was found buried in the new lava flows. The flow was at least two kilometers (1.2 miles) long, but so far, it is hard to tell its full scope, said Chadwick. He said that it might be three times bigger than the one in 1998. The latest eruption caused the caldera floor to sink by more than two meters (six feet). The bottom-anchored instruments documented hundreds of tiny earthquakes and sinkage of the caldera during the volcanic eruption, but those readings were not retrieved until the latest visit. On the day of the eruption, land-based seismic monitors and a hydrophone array operated by the U.S. Navy detected only a handful. Bob Dziak, an Oregon State marine geologist who monitors the Navy array, said that because the quakes detected were so few and relatively small, the team did not suspect an eruption at the time. The scientists will measure the rate of inflation over the next few years to see if they can successfully forecast the next event. “The acid test in science – whether or not you understand a process in nature – is to try to predict what will happen based on your observations,” Chadwick said. The study was jointly funded by the National Oceanic and Atmospheric Administration and the National Science Foundation. 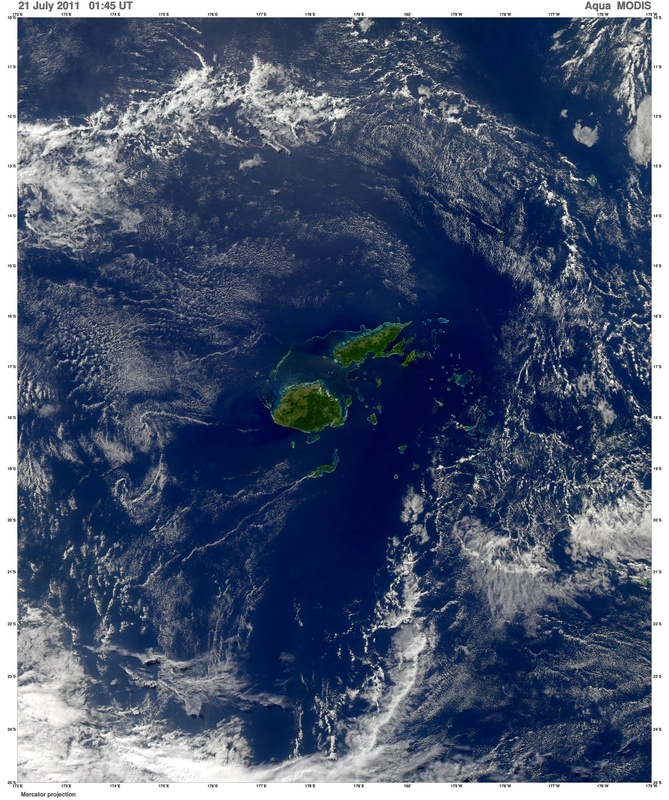 Surrounded by the warm waters of the South Pacific, the Fiji Islands are often cloaked in clouds when the Aqua or Terra satellites fly over. But July 21, 2011, offered up a perfectly cloud-free view. This image from the Moderate Resolution Imaging Spectroradiometer (MODIS) on Aqua shows Fiji’s second-largest island, Vanua Levu, and the Cakaulevu Reef that shelters the island’s northern shore. Also called the Great Sea Reef, Cakaulevu shines turquoise through clear, shallow waters. It is the third longest continuous barrier reef in the world, behind the Great Barrier Reef in Australia and the Mesoamerica Reef off Central America. When combined with the nearby Pascoe Reef, Cakaulevu Reef is about 200 kilometers (120 miles) long. On its own, the Cakaulevu Reef covers 202,700 square kilometers (77,200 square miles). The first systematic survey of the reef (in 2004) revealed a diverse marine population, including unique mangrove ecosystems and endemic fish. Twelve threatened species live within the reef: 10 fish species, the green turtle, and the spinner dolphin. All of this marine life has traditionally supported the native population, and currently some 70,000 people depend on the reef. After seeing fish populations decline in recent decades, local leaders created a series of marine protected areas in 2005 where fishing is prohibited. Traditional customs used to manage the reef for hundreds of years permit leaders to set aside portions of the qoliqoli, or traditional fishing ground. Where the ban has been enforced, fish populations are rebounding and spilling over into areas where fishing is permitted. From space, none of this bounty is visible. Instead, the beauty comes from the vivid shades of blue and green coral creates when viewed through water.